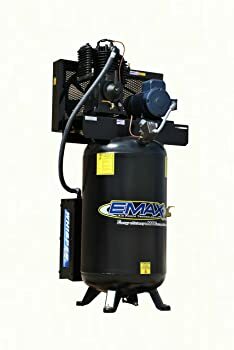 When you check out EMAX Air Compressor, there is no denying that it is a powerful air compressor. This tool is designed to last for at least 50,000 working hours if you take good care of it. This appliance also boasts a distinctively low rotation per minute pump. It can deliver 100 PSI and 19 CFM. That is an outstanding power. It also explains why the tool is widely used in manufacturing areas, factories, and large sale workshops. All these features I have just outlined were put in place to deliver the highest efficiency and convenience for you.